I think I’ve been intending to read a Max Lucado book for about 10 years now. I finally decided to read one of his books after I saw him speak at the World Vision Artist Retreat this past January. Max comes across as an incredibly genuine and kind guy. I picked up this book, ‘Max On Life‘, and another recent offering, ‘Out Live Your Life’. 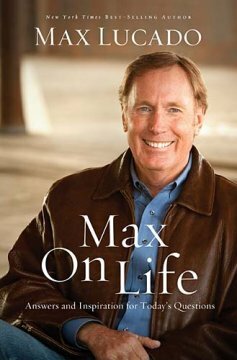 Max On Life is a book of 172 questions that Max says he gets on a consistent basis. All the questions have something to do with faith and Christianity and Max offers answers to each of these questions. I have to say I wasn’t a big fan of this book. Perhaps I’m not the primary audience Max is trying to reach, but I felt like a lot of the responses and answers to these questions were kind of sugary sweet and somewhat expected from the Evangelical Christian perspective. It’s not that Max didn’t respond with truth in his answers, even though there were a few that I personally didn’t fully agree with, I just felt like I’ve heard these things said a hundred times in sermon after sermon. I’m sure there will be some readers who will really engage with Max’s writing. I could envision someone connecting to this book who is newer to the Christian faith and needing to find some clarity as they’re wrestling through the complexities where humanity and faith converge. One question and topic that I felt Max did a great job of bringing some fresh insight to was #156, regarding suicide. I have heard a lot of people speculate and issue judgement on the eternal consequences of suicide, but never felt like anyone offered the grace I sense God would have towards it. Max offers some perspective on this that I feel is profound, full of grace and well thought out. While this book didn’t resonate with me, I’m still planning to give Max another read. His writing style is interesting to me and I’m looking forward to enjoying his writing in another book, outside of the Q&A format. I like Max’s books although I find his writing style, shall I say different than most. I enjoy it but I have to switch gears in my brain to follow a lot of times. On the subject of suicide, I have always felt this. That is God does not condemn a person for dying of the sickness of cancer, heart disease, or any other physical ailment, then why would He condemn a person for dying of a mental disease? Just sayin! Interesting thoughts on Max’s writing style. I appreciate the input. Re: suicide, I definitely agree with you (and so does Max.) I’ve heard too many preachers and Christians condemn suicide victims to hell because they pass judgement on it as a sin. That judgement doesn’t seem to be as prevalent today, or at least in the circles I run in now, there seems to be more acceptance and grace from the faith community on the issue of mental illness. That’s why I was glad to note Max’s input on the subject. Thanks for reading and commenting here Duke!